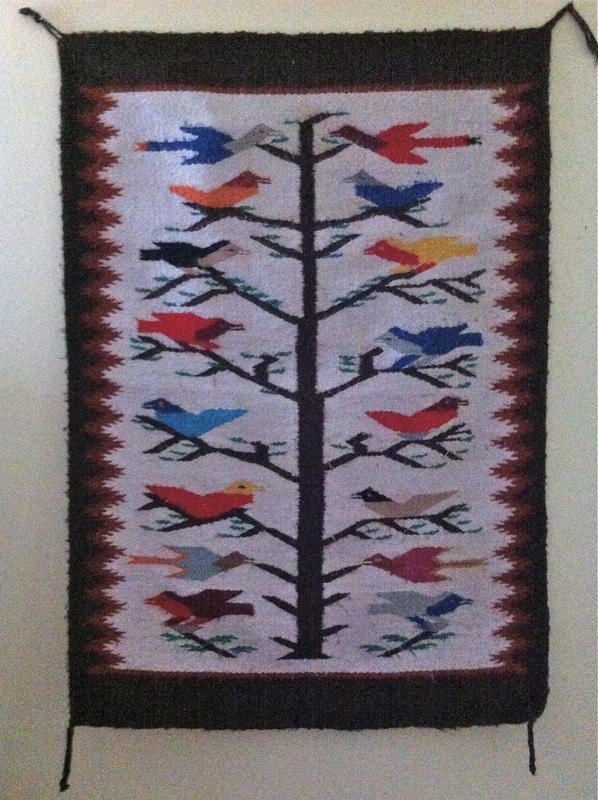 A couple of weeks ago, I finally found me a Navajo pictorial rug. According to A Guide to Navajo Weavings, by Kent McManis & Robert Jeffries, these carpets may have first appeared as early as the 1840s (“four small birds can be seen on a wearing blanket owned by the Cheyenne chief White Antelope when he was killed at the Sand Creek Massacre in 1864”). Generally, pictorial patterns didn’t become the main focus of the weaving until the 1950s. Bird pictorials like this one are fairly common, though they usually feature the birds on a corn-stalk. I was so happy to have finally found a pictorial, and a nice one at that. The colours are as bright on the reverse as they are in the front and it’s only issue was some pilling. Alas, my camera broke and the cat needs dentistry so I have listed this and my Turkish Kilim on eBay.